Veggies Rule: Promoting Unhealthy Food. And, no, it's not me who is promoting unhealthy food….far from it. This video (at the end of this post) came across my desk the other day and when I first viewed it I must admit it did look like a good idea to help with a cultural tradition, but then I got to thinking about it and suddenly it just seemed wrong on many levels. It's not the actual "mask" that is the problem. Again, people are bombarded with the marketing strategies of the corporate fast foods..the most unhealthy foods on the planet. Here are people who have been healthy eaters until the western fast food companies arrived and now these companies are determined to really try to corrupt a nation and increase their risks of numerous diseases all associated with processed, nutrition-less foods. Who gains by the deterioration of a country's health - the pharmaceutical companies?, the medical profession?, the health insurance companies?, the meat processing companies?…..I'm sure the list goes on and, do you notice that these are all the big corporations - of course you do. And on the flip side - who suffers? The nation's ordinary man in the street?, the environment?, the farmers who practice sustainable farming?, the organic industry? all of whom are the victims of the abuse from the fast food industry who really don't give a jot about the Joe Blogs of this world. 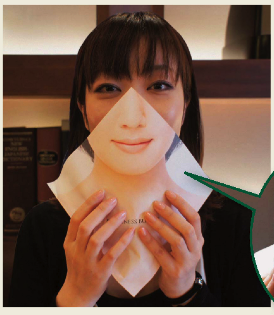 Again, it's not the "mask" - it's the marketing ploy totally invented to increase sales (and it's worked). Time to make a stand….we can each do our bit by refusing to purchase from these food outlets - start eating whole foods and actually "know" what you are putting into your mouth.